Blogging is tough. There is so much to learn and it’s hard to know where to start. 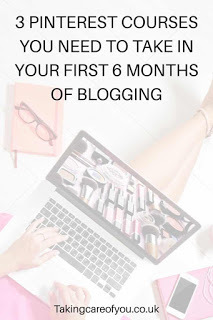 Are you are in your first few months blogging and not sure how to drive traffic to your blog? 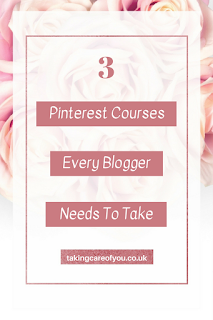 If you are struggling to learn how to use Pinterest effectively then these 3 courses are just what you need. I have been blogging for 9 months now and it’s been a steep learning curve. I struggled through the first couple of months, deleted everything and started again. I was much happier this time around but still struggled to get traffic to my blog. I had no clue what I was doing and was lucky to get the very few page views I had. I had set up all the social media accounts but again I didn’t really know what I was doing. I knew nothing about internet marketing. Pinterest baffled me, Facebook was impossible and I’m not even going to comment on Twitter! I knew that if I wanted to get serious about blogging I would have to educate myself. I did not have a huge amount of money to spend on courses so I did a lot of research. I needed to find a few courses that were worth my money and my time. I would advise you to do plenty of research before investing in a blogging course to be as sure as possible that it’s a good fit for you. I read up on all kinds of courses, read the course content and the reviews, I also hung around blogging Facebook groups to see which courses were being discussed. I knew my niche was a good fit for Pinterest if I could use it properly, so that is where I focused my attention. Pinterest is a visual search engine with over 200 million monthly active users! 200 million!!! Pinterest users are usually looking for 1 of 2 things. A solution to a problem they have, or something to buy. That’s fantastic news for bloggers, so we would be pretty silly to turn down all of that free traffic! With the correct strategies Pinterest can drive HUGE amounts of traffic to your blog, and that’s not something you can afford to miss out on. I knew the potential for massive amounts of Pinterest traffic was there, but I need to learn how to harness that potential and use it to drive that traffic to my blog. The 3 courses that I chose to take after a lot of reading are all super affordable. Despite not having a high price tag they are all packed with useful information and actionable tips. I want to share them with you because without them I’m not sure I would be blogging now. I must add that I took these courses over a period of 3 months and I would never recommend trying to do everything at once. It is best to take your time over each course and implement everything before moving on. Megan has put in hours and hours of research to find out everything there is to know about Pinterest. She has had amazing results with her strategies. The course starts right at the beginning, taking you through the setting up of your Pinterest account and how to make your profile look professional. It covers everything from group boards, how to make pins, to Pinterest SEO. There are also sections on branding, Facebook and monetising your blog. The course comes with some incredible resources to help grow your blog. Megan also regularly offers free updates on the course. This course is perfect for new bloggers and Pinterest newbies. It takes you through everything step by step in a way that is manageable and easy to understand. I saw amazing results as soon as I started to implement the course. Pinterest is now my number one source of traffic. When it comes to Pinterest, Carly really knows her stuff. This ebook details the unique pinning strategy that soared her page views to over 200,000 per month! Without using scheduling tools like BoardBooster and Tailwind. Carly gives a completely different take on Pinterest. As well as her pinning strategy, Carly shares some valuable information on Pinterest that will completely change the way you pin. This ebook is not for new bloggers. You need an established Pinterest account and a fair number of blog posts to be able to implement this strategy. I found this strategy easy to put into practice and the results were astounding. Within 2 weeks I had tripled my Pinterest traffic! Check out Pinteresting Strategies here. Coco is a very successful affiliate marketer and shares her strategies in this ebook. She covers everything you need to know about how to make money with affiliate marketing on Pinterest. As well as Coco’s pinning strategy the ebook explains the basics of affiliate marketing, and how to optimise your Pinterest account to get the best out your affiliate pins. There are also a couple of valuable resources included to help you on your way. This ebook is for anyone who wants to make some extra money. And I mean anyone! You don’t even have to have a blog. Coco’s strategy has been invaluable to me as I began to see results straight away and have been able to earn some money to put back into my blog. So as you can see, high quality blogging courses with good information do not have to break the bank. I have had such great results from these courses and I highly recommend that you check them out. What courses have made a difference to your blog? Tell me in the comments. If you choose to take one of these courses, let me know what you think. Download my free Ultimate Guide For New Bloggers.